Haryana State e-NAM Review & FPO’s Onboarding Meeting on e-NAM held on 29th May'2018 - Khand Bhavan, Gandhinagar chaired by MD SFAC and Gujarat Agriculture Secretary. Gujarat State e-NAM Review & FPO’s Onboarding Meeting on e-NAM held on 29th May'2018 - Khand Bhavan, Gandhinagar chaired by MD SFAC and Gujarat Agriculture Secretary. 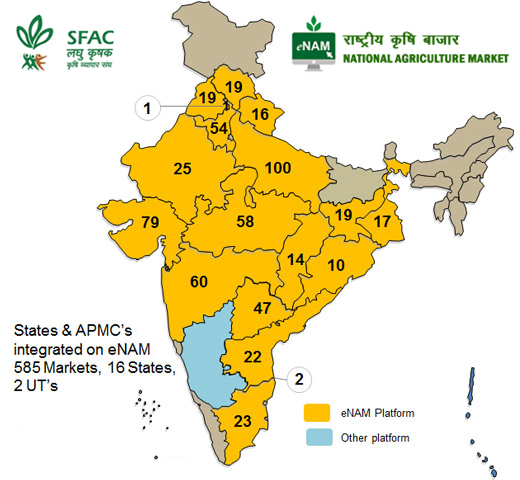 PM Launches agro e-trading platform e-NAM. How to Use e-NAM Portal? How to Use e-NAM Mobile App? How to Enter and Exit Mandi? Training capsule of 1st round may be used in pdf form here for this question. How are Lot Operation Managed? How to participate in Auction?